On the edge of a sun-drenched Caribbean island, a young man in a floral Speedo strikes a yoga pose. He stands apart from the throng of beachgoers, gazing off pensively toward the horizon. After his meditation on the warm, white beach, he joins newfound friends for a drink – and finds a long-lost cousin – all within the hour. Diwigdi Valiente, 28, crosses between cultures as an environmental advocate and entrepreneur. Very few links bind the San Blas islands of Guna Yala – the autonomous province of the indigenous Guna people in Panama – and Kalu Yala, the self-described “sustainable town” underway in the Tres Brazos Valley. But Valiente is one of them. In spring 2018, Valiente and business partner Allan Lim opened their second Bodhi Hostel, their venture in ecotourism, on the lush grounds of Kalu Yala. The duo studied hospitality at the same César Ritz college campuses in Switzerland, missed each other by a year and several thousand miles, then connected through a friend back in Panama. There, they found that Valiente’s free spirit blended perfectly with Lim’s strategic thinking – right brain met left brain to mold the Bodhi business model. Though Bodhi keeps “enlightenment through travel” and sustainable living at its core, it is, after all, a business. Ringed by palm trees on the San Blas islands, he slapped a wood table in the community dining hall of the Cabañas Niabub for emphasis. His grandparents live on these islands, his father was raised there, and he spent much of his childhood surrounded by the Guna “environment of socialism” of sharing. Since he was young, the Guna community immersed him in communal sharing, the lifestyle he believes we must have “in order for this planet to survive.” Switzerland, however, crystallized environmental sustainability for him – a term unknown to most of the Guna community. But living in equilibrium with nature pervades the lifestyle of the people. Sustainability as a force of balance with nature is stitched into the fabric of Guna life with the seamlessness of traditional molas. This indigenous people has subsisted off the Panamanian and Colombian land since before the Spanish invasion; hunting, fishing, farming. The modern interpretation of “sustainability,” however, remains distant. As global sea levels creep higher, the comarca faces one of the growing litany of threats to indigenous island people who will be forced to move because of climate change. A human forced change in climate patterns is neither widely discussed, accepted, nor understood on the islands where people are far removed from the lifestyles causing global warming and sea level rise. Resistance to a seemingly inevitable move to the mainland is one among many pressing problems. Valiente is a cultural liaison of sorts, in constant flux between “the City” (Panama City) where he spent much of his childhood, the islands where his grandparents live, and Bodhi hostel locations at Kalu Yala and el Valle de Antón. He embodies the bridge that spans from the traditional nose ring of his grandmother to the Guna youth to the entrepreneurial outside world. That bridge bears the weight of an entire community – with an incredible support beam: his father, Aresio Valiente López, a University of Panama law professor and lawyer of the General Guna Congress. There is a glowing filament of pride between the two. Valiente teared up introducing his father’s work as a professor at the University of Panama where he is an expert in agricultural law, environmental law and human rights; a writer, poet, dancer, bohemian. “The students have to overcome the teachers,” López responded. A parent is a child’s first teacher, he said. One can only hope their children will achieve more than them – like, he says, his son did. In the Guna religion, the Great Mother (Nan Dummad) exists alongside the Great Father (Bab Dummad). Close to the land, the sea and the environment in general, the people believe in nature. They place their faith in the world around them as well as a higher power, but this can prevent a belief in the hard science behind climate change. 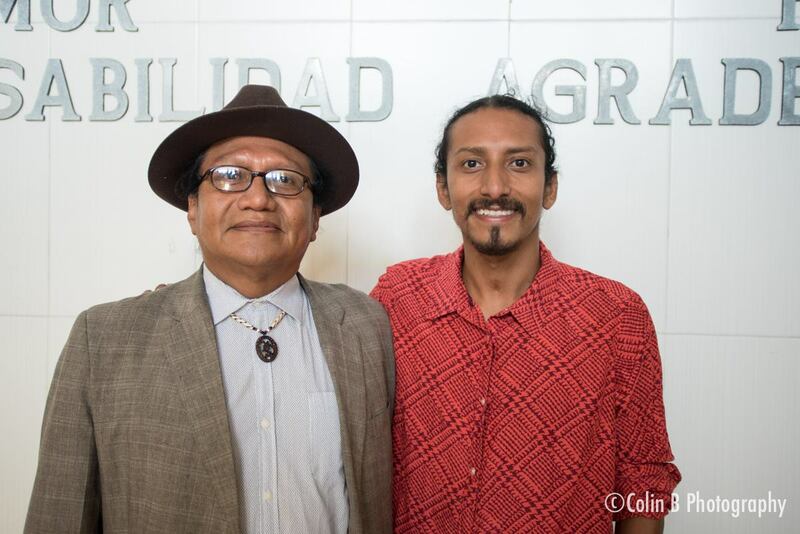 The elders and those in charge of the sovereign Guna Congress, Valiente says, are “super wise, super wise – but when you put them next to me, we have seen two different worlds… We can have a different perspective and a different view, but at the same time, these people were trained 30 years, learning about our traditions." While he fights to preserve traditional culture, Valiente has also embraced a modern way of life. Coming out of the closet opened doorways toward self-expression, liberation, and the art he creates today, his business partner said. Valiente does have that. The self-described “idea hatcher” has that x-factor that allows him to flow from a professional post as a transfer pricing analyst in Panama’s Ministry of Economy and Finances to founding Burwigan, an art project teaching Guna kids about climate change. He is a change maker, and his tool of choice is tourism. Amid the tattoo art swirling on his tanned skin – a papaya (his connection with femininity), a rue flower (his grandmother bathed him with it as a child), a heart containing the Catalan flag (for his partner) – the Bodhi Hostel logo (the bodhi tree) makes an appearance on his left forearm. Valiente pours himself into everything he does: Bodhi was chosen by Hostelworld.com as the best hostel in Panama within a year of its opening. He has etched the bodhi tree onto himself as a symbol of enlightenment and a constant reminder of his job, both at the hostel and in the world at large. He lives and works to create environmental change, and to spread the message from traveler to traveler until the world hears about Guna Yala’s fight for existence. The yoga pose he struck on the beach was the Warrior Pose. Valiente may cross cultures and defy definition, but one thing we know to be true: he is a climate change warrior.